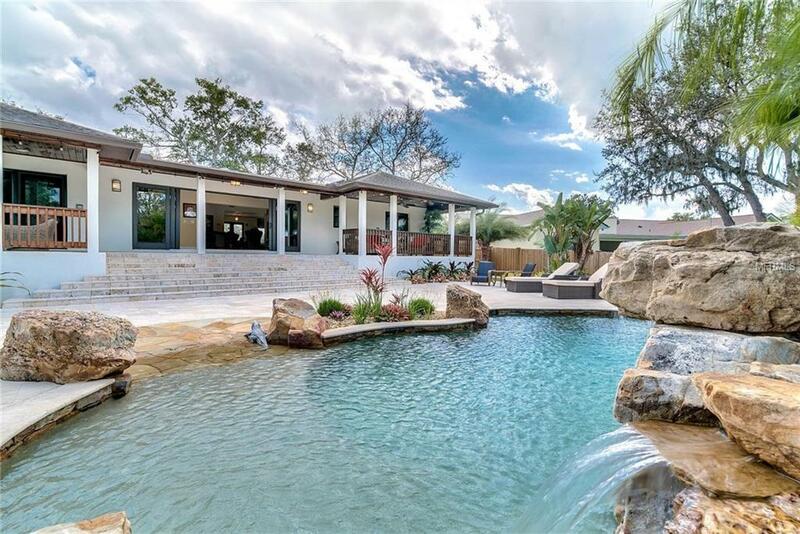 Take a look at this rare opportunity to own one of the nicest homes in Bay Hill. You will be amazed at this fully remodeled one story ranch on a fenced in half acre lot. As you pull up you will immediately notice the half circle paved driveway with plenty of parking flanked with lush mature landscaping. Double glass doors welcome you home to an open floor plan adorned with designer porcelain tiles, contemporary light fixtures, and a family room with a stacked stone accent wall and fireplace. The kitchen is fully equipped with stainless steel appliances, vented hood, 42 wood cabinets, and granite countertops. The spacious master bedroom opens up the covered lanai and includes a walk in closet, dual vanities, and tiled shower. You will feel like you are on vacation once you pass through the large sliding glass doors leading to the Costa Rica inspired backyard. The beach entry pool evokes a relaxing tropical oasis with soothing sounds from the natural stone waterfall. Bay Hill offers the world famous Arnold Palmer Golf Club, access to The Butler Chain of Lakes, "A rated schools, close proximity to the Orlandos best restaurants, shopping, and attractions. Dont miss out on this extraordinary property. Be sure to click on the virtual tour link.